How about a little bit of extravagance on your trip to reward yourself? Reward yourself with beautiful surroundings in Kannabe Highlands. Arrive for an earlier check-in. Check out some of the lodging spots in Kannabe that offer affordable lodging and friendly staff. If coming by car, feel free to head on up to your lodgings. If you are traveling by train, check with your accommodation when you make reservations to see if they have a free shuttle service to come and get you from JR Ebara Station. Feel the wind in your hair as you cycle through the Kannabe Highlands. The guide will take you to a spectacular waterfall and on a course under the expansive skies. Reservations are required in advance and a group of no less than but no more than 6 is required to make the reservation. There are two times to choose from; 9:30AM start or 1:30PM start (times subject to change and cancellations due to weather or other reasons are possible). Price is 4,500 yen per person (prices subject to change). We hope that it was a good day for you. Now it’s time to wind down by taking a dip. Now, head on back to your room and rest up for another adventure tomorrow. Check out some of the lodging spots in Kannabe that offer affordable lodging and friendly staff. Finish your day off with a delicious meal and refreshing drink. Perhaps a toast to a good day with a local sake is in order? Have a lazy morning and then head out to soar in the skies. There are a few paragliding schools in Kannabe where you can take half or full day lessons. Some schools also offer two day courses. You will receive full safety instructions by professional paragliders. For those wishing to fly a little higher (about 530m – 720m), tandem flights are also available. Courses are available from March to November. Now that you have worked up an appetite its time to enjoy a lunch made with fresh local ingredients. 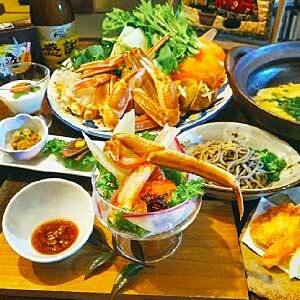 A Japanese style restaurant that serves an array of local and seasonal ingredients. We suggest the all-you-eat crab when it is in season. Now for some free time. May we suggest exploring the local towns before you head out? After your coastal drive start heading back towards Kannabe, but before you head home we suggest stopping by Kinosaki Onsen, a 1300 year old hot spring town. 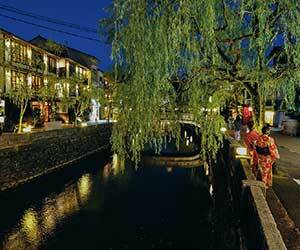 Famous for its 7 hot spring bath houses and old world atmosphere.